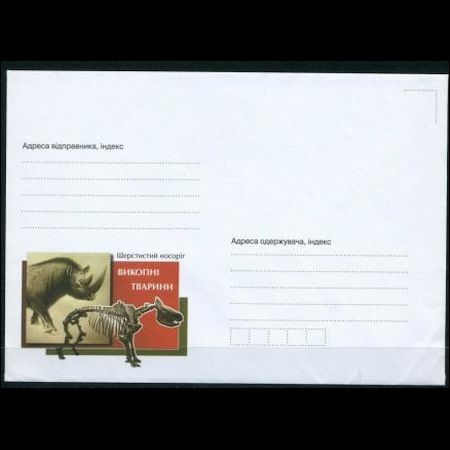 Ukraine 2009 "Unearth animals of Staruni , Ivano Frankovsk"
While the Wooly Mammoth ranged through Europe, Asia and North America, Coelodonta the Wooly Rhinoceros never made it to North America. Well-preserved remains have been found frozen in ice and buried in oil-saturated soils. At Staruni in what is now the Ukraine, a complete carcass of a female rhinoceros was found buried in the mud. 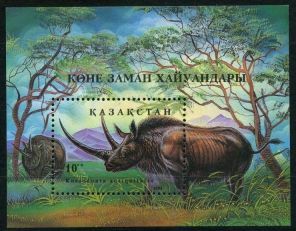 Kazachstan 1994, Hairy rhinoceros (Coelodonta antiquitatis). The combination of oil and salt prevented the remains from decomposing allowing the soft tissues to remain virtually intact. On October 5, 1907 during underground work in mines at a depth of 12.5 m embalm body of a mammoth (Elephas primigenius Blmb) has been found Firstly the workes didn't recognize tha value of their discovery , and spread a skin of the animal to the homes , to make some sewing sandals out of it. Only on November 7, 1907 unearth animal moved to museum of Dzieduszycki in Lvov (currently The State Museum of Natural History in Lviv) . The fossil has very good preserved stomach which even include some herbaceous plants eat by the animal just before it died. 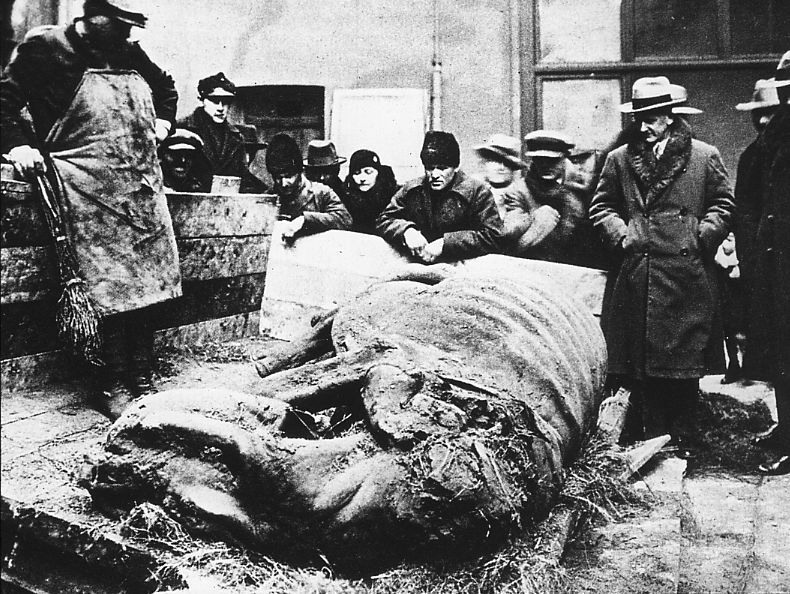 On November 6, 1907 in the same mine at a depth of 17.6 m large fragment embalmed wooly rhinoceros (Rhinoceros antiquitatis Blmb) found. However further excavations in the mine continued until November 25 but did not give new results. Many scientists have research both fossils, results of their work is published two-volume book called Wykopaliska Starunskie on 1914 in Krakow, Poland. In 1929 Polish Academy of Sciences organize another expedition in the vicinity Starunia. Another embalmed wooly rhinoceros (age - 24 thousand years), and the remains of many other animals of ice age: the original bull, horse, roe, fox found there. Most of the findingsare stored at the Museum of Jagiellonian University in Krakow. 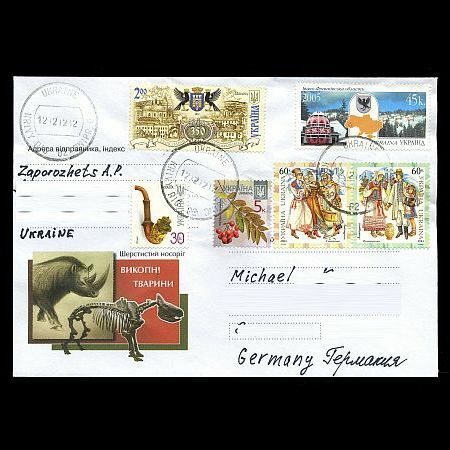 Note: the blue stamp on top-right corner shows some sightseeing of Ivano Frankovsk region of Ukraine, as well as it's loaction on Ukranian map. 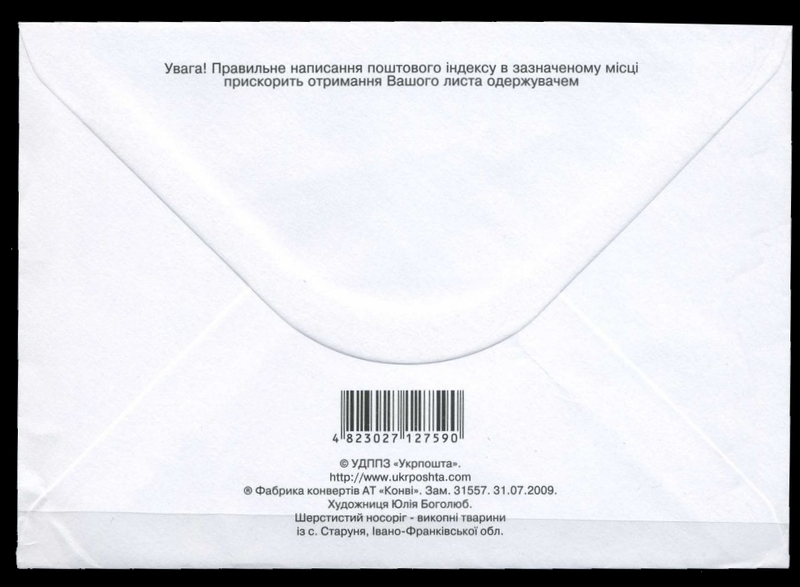 Another stamp on a top commemorate 350 years of Ivano Frankovsk. 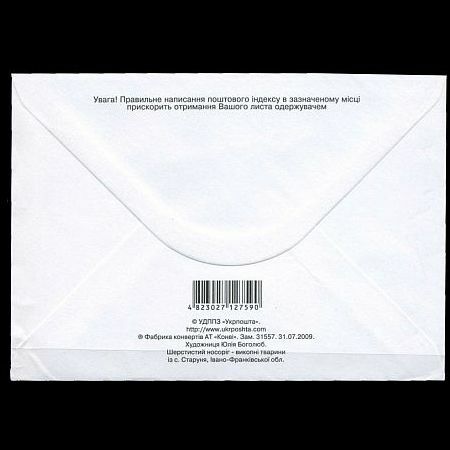 Two stamps with dancing people are part of set of 6 values "Traditional Costumes" and shows traditional costumes of Ivano Frankovsk region.